Tamiflu has just one anti-viral incredient in it and that is Star Anise. A herb that is mainly used by TCM (Traditional Chinese Medicine). Yet TCM would never just prescribe just one herb to do the job. TCM looks at the entire bodily condition and strengthens the entire body with several herbs and acupuncture or even Qi Gong exercises. TCM had a cure rate for diseases in general of over 95% (before China was invaded with MSG, junk food and GMOs). Western medicine can just dream of that. Western medicine has a very high ‘supress the symptoms rate’, which usually aggravates the health condition in the long run (as intended), but then thats it. Big Pharma and western medicine just ‘borrow’ ancient knowledge, patent it and sell it to you as ‘the cure’ and calls herbal medicine ineffective and unscientific. Toronto — Canadian health authorities will not change their practice of prescribing the anti-viral drug Tamiflu to treat cases of pandemic H1N1 flu in children, despite a new study that raises questions about the drug’s effectiveness. Researchers at the University of Oxford cautioned about the broad use of anti-viral drugs to treat children 12 years of age and younger suffering from seasonal flu. They found anti-viral drugs have little or no effect on asthma flare-ups, ear infections or bacterial infections in children. Tamiflu was also linked to increased vomiting. The authors questioned whether children would face the same risks when being treated with anti-virals for the pandemic H1N1 flu virus. But the Public Health Agency of Canada assured parents Monday that Tamiflu has a strong safety profile, and has recommended doctors prescribe it for infection prevention and to treat cases of H1N1 in infants under one year. 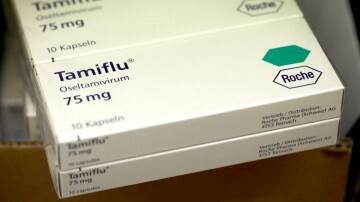 The pandemic virus has shown resistance to Tamiflu, one of two anti-virals that can keep it in check if taken within days of the first symptoms. However, there have been people who have fallen ill despite taking the drug. The study, published Monday in the British Medical Journal, found anti-virals shortened the duration of seasonal flu in children from between a half-day and 11/2 days. But the study found no clear evidence the anti-virals prevent complications in children with seasonal flu. It didn’t prevent asthma exacerbations in asthmatic children or lower rates of antibiotic prescriptions, for example. The researchers did not study the effects of anti-virals on children with H1N1 flu, but said that based on some evidence, anti-virals might have “limited” effects on preventing complications. “While morbidity and mortality in the current pandemic remain low, a more conservative strategy might be considered prudent, given the limited data, side effects such as vomiting, and the potential for developing resistant strains of influenza,” Matthew Thompson, a senior clinical scientist at Oxford, and his colleagues concluded. The researchers conducted a scientific review of seven previous studies, known as a meta-analysis, on the use of anti-viral drugs for seasonal flu in children. Four studies looked at the treatment of influenza, the other three looked at the use of drugs to prevent infection. Grant Stiver, a professor of medicine in infectious diseases at Vancouver General Hospital and the University of British Columbia, dismissed the findings. “I don’t think I would base any clinical judgment on this study,” Dr. Stiver said in an interview. Trials done on Tamiflu have shown the drug to have benefits when it comes to seasonal flu, even in children, he said. Although there isn’t much data on anti-virals and the H1N1 virus, Dr. Stiver said Tamiflu helps prevent the spread of infection in the early stages and, more importantly, in the absence of a vaccine. Avec le Codex Alimentarius,Big Pharma,nous voyons que ce n’est pas pour notre bien qu’ils travaillent. Pour eux ce qui est important c’est $$$$. Saviez-vous qu’au Canada nous avions un gouvernement paralelle,il se nomme ”Power Corporation”, Desmarais family. Je vous laisse un lien qui est fort interessant,pour nous le peuple Québecois.